You don’t choose a college based on its looks, but if the place where you’re planning on spending most of your time for the next four (or more) years is stunning, it can only be a good thing. After all, your campus is your home away from home, so choosing one that’s gorgeous, as well as well-rated, is a surefire way for you to have the time of your life. From amazing natural surroundings to breathtaking architectural pieces, here are 11 beautiful college campuses in the US that are sure to be a source of pride for the students and the staff. 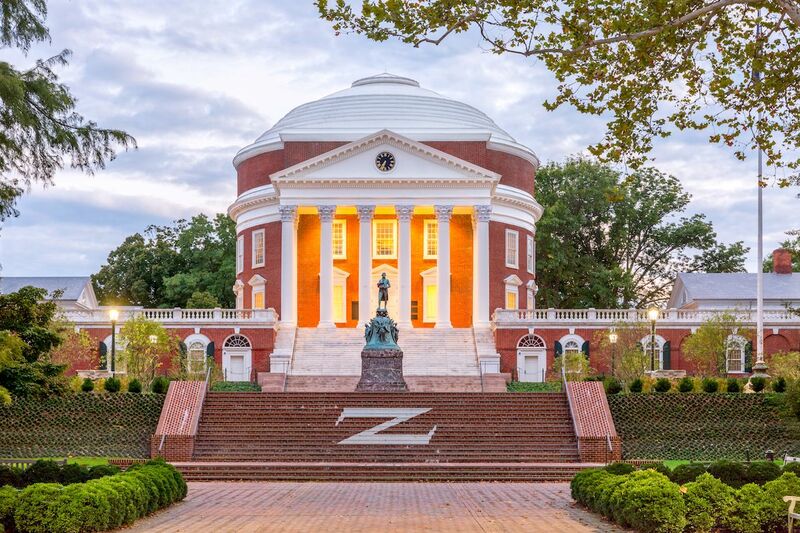 The only university in the United States designated a UNESCO World Heritage Site, the University of Virginia is one of the oldest in the country, founded in 1819 by Thomas Jefferson. The author of the Declaration of Independence and the third President of the US was a talented architect, and the Academical Village he designed is still at the heart of the campus. Dominated by the Rotunda inspired by the Pantheon in Rome, the Academical Village follows a U-shaped plan, where the buildings surround the Lawn, a terraced green space. The Rotunda, the school’s iconic, most recognizable building, stands on the northern side of the Lawn. 10 pavilions interspersed with student rooms extend on its sides, each built in a different style, with their own gardens, separated by serpentine walls. 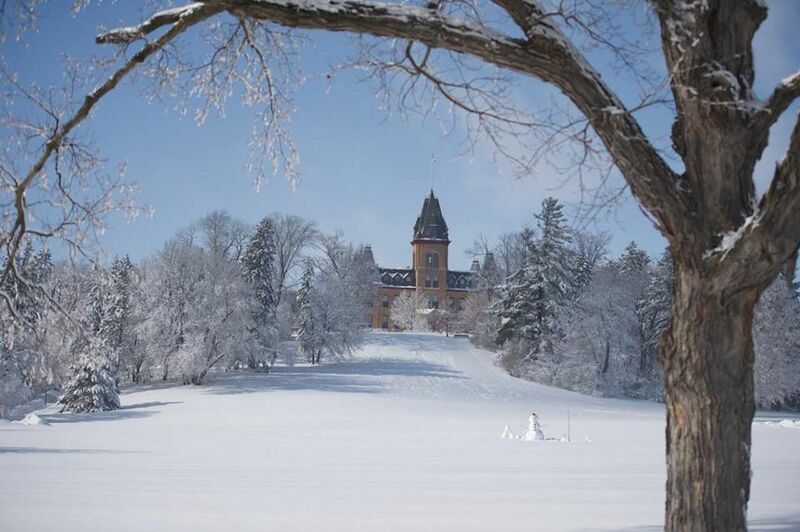 St. Olaf’s picturesque campus, known as “the Hill” is set amid restored wetlands, woods, and native tall-grass prairies. Opened by Norwegian-Americans in the late 19th century, the College prides itself in environmental sustainability, being the first in the nation to use a wind turbine to supply about one-third of the school’s energy. The college’s most recognizable landmark is the beautiful Gothic-style Old Main, built in 1877, the first structure on the grounds. One of the more modern buildings, the Christiansen Hall of Music, was recognized by the American Institute of Architects in its Architecture MN magazine. The University of Washington’s main campus has gorgeous views in all directions, of Mount Rainier, the Cascades Range, and the Olympic Mountains. Red Square is at the heart of this campus, surrounded by landmark buildings like the Suzzallo library with its 35-foot-high stained-glass windows and gilded vaulted ceiling. But it’s the North Campus that features the University’s most recognizable landmark, the Liberal Arts Quad. 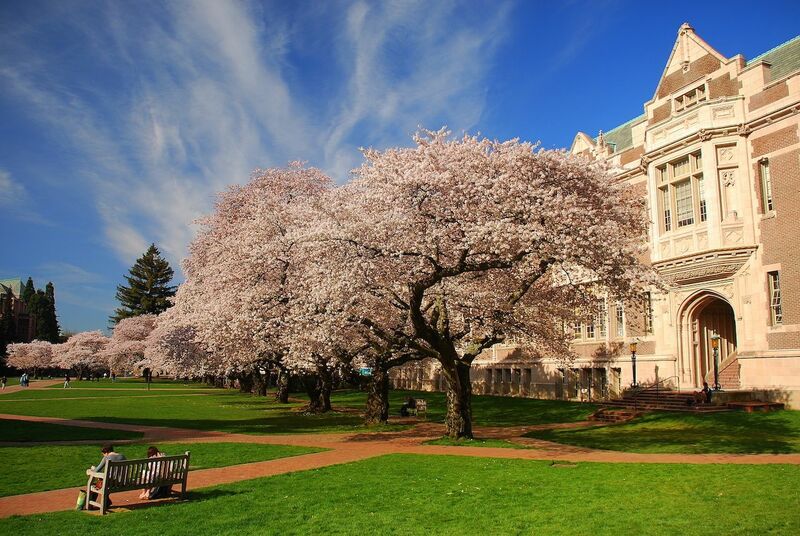 Filled with cherry blossoms, courtesy of the 31 Yoshino cherry trees, the grounds of the Quad put up quite a show each spring. 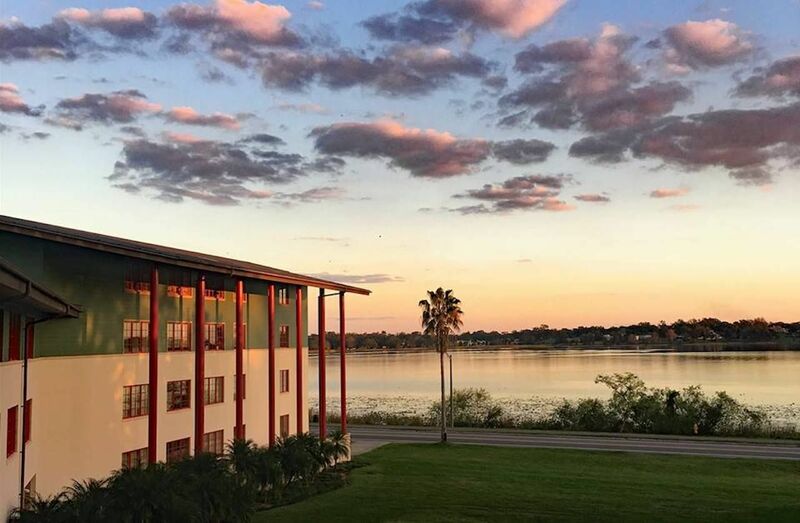 Sitting on a hillside overlooking Lake Hollingsworth, Florida Southern College is home to the world’s largest number of Frank Lloyd Wright buildings. A National Historic Landmark since 2012, the campus was dubbed the “first uniquely American campus” and is listed on the National Register of Historic Places. One particularity of the Florida Southern College campus is the many cats you’ll encounter while gawking at the gorgeous architecture and natural surroundings. Around 30 cats live around the campus. They’re all neutered/spayed and vaccinated. A small team of caretakers feed and care for them every day. 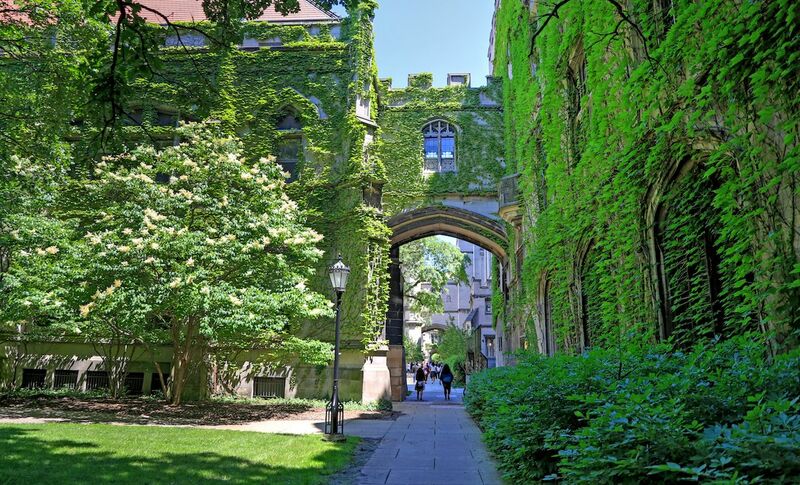 The campus of the University of Chicago combines traditional English Gothic-style architecture with modern design in a setting that seems like a small pocket of nature in the middle of Chicago. The 217-acre campus includes a few parks and an official botanical garden. The surroundings include a pond — home to ducks, turtles, and dragonflies. The gorgeous Cobb Lecture Hall, built in 1892, was the first of the University’s original 16 buildings. The nearby ivy-filled Hitchcock Hall, built in 1900, has been on the list of the National Register of Historic Places since 1974. The campus is also home to the Robie House, a Frank Lloyd Wright building and a National Historic Landmark. 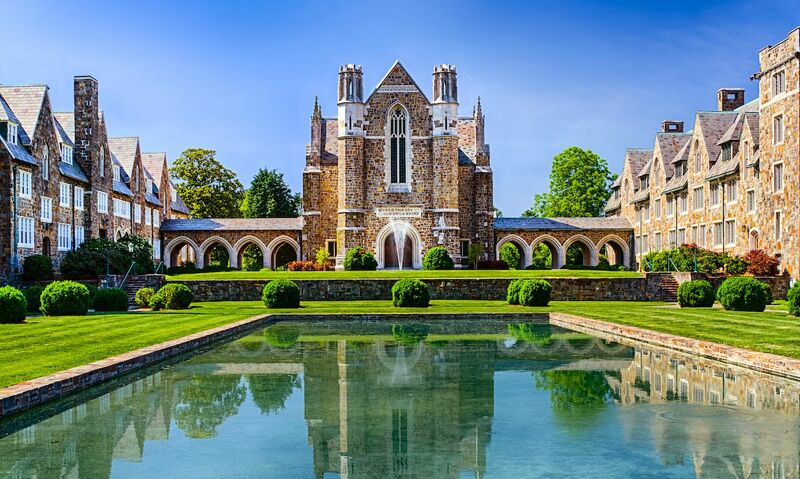 Berry College’s campus is the largest in the contiguous US and its 27,000 acres include forests, fields, and Lavender Mountain. With over 80 miles of trails, surrounded by wooded areas, streams, and ponds, it is a great place to spend time outside the classrooms. The area around the academic English-Gothic style buildings, surrounded by fountains and pools, is a wildlife refuge. Mary Hall and the Ford Dining Hall are the most recognizable buildings on campus. The oldest buildings, rustic and representative of the College’s history, are the Roosevelt Cabin, House o’Dreams, and Old Mill. 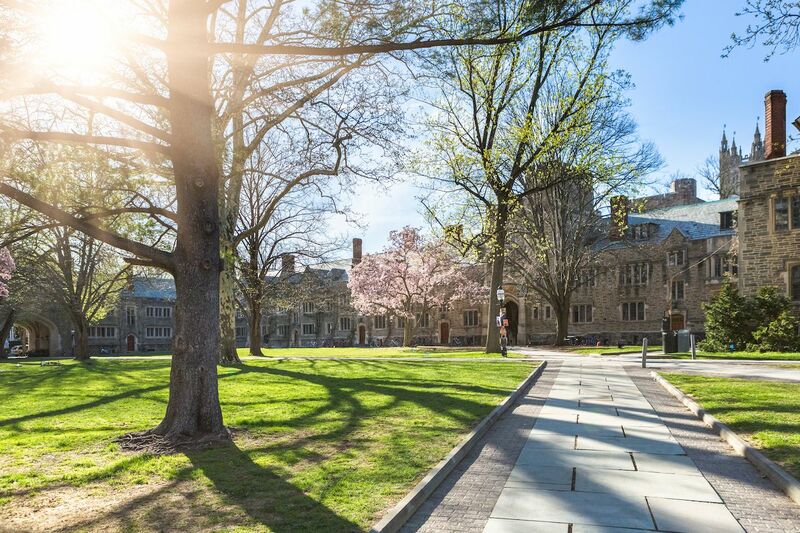 Princeton is filled with beautiful buildings surrounded by perfectly manicured green expanses, courtyards, and hundreds of crisscrossing paths. It’s like an American version of Hogwarts, but without the Quidditch pitch. Completed in 1756, the stunning Nassau Hall is the oldest building on campus. Before becoming the center of the campus, it was the original home of the New Jersey Legislature and the Seat of the Congress of the Confederation. Involved in the battle of 1777, it was added to the National Register of Historic Places in 1966. 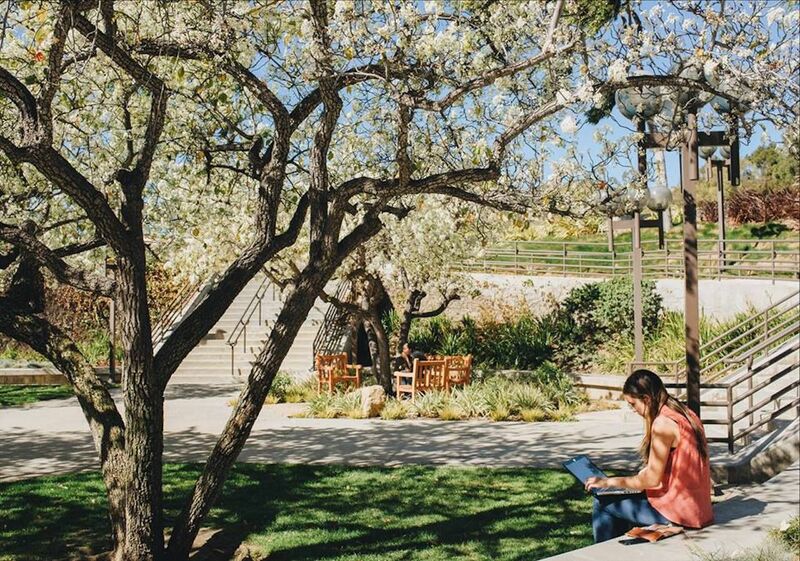 Sitting among several ridges overlooking the Pacific, in the foothills of Santa Monica mountains, the campus of Pepperdine University is one of the most scenic in the country. Palm trees dot the landscape and give the campus a tropical feel, accented by the Mediterranean-style buildings with white stucco and red roofs. Alumni Park offers trails among hills, ponds, coral trees, and lawns with views of the ocean. Set on top of Palatine Hill, the forested 137-acre campus of Lewis and Clark College bathes in nature. Surrounded by woods, the College’s centerpiece is the historic Frank Manor House, a rustic, Tudor-style mansion, designed by local architect Herman Brookman and built in 1924. 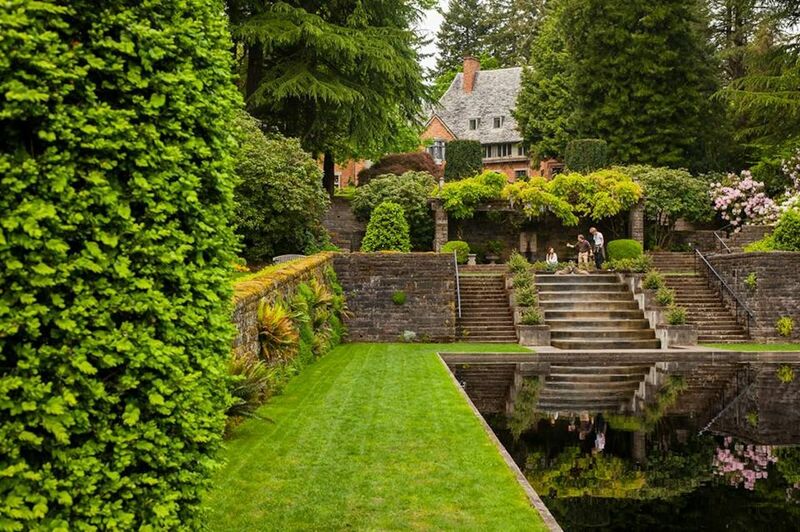 A large pool bordered by flower beds sits at the back entrance of the mansion and the Tree Walk that consists of native tree species encountered by Lewis and Clark on their journey surrounds it. The views of the perpetually snow-capped Mount Hood, about 50 miles away, add a touch of magic to the already incredible natural beauty of the campus. 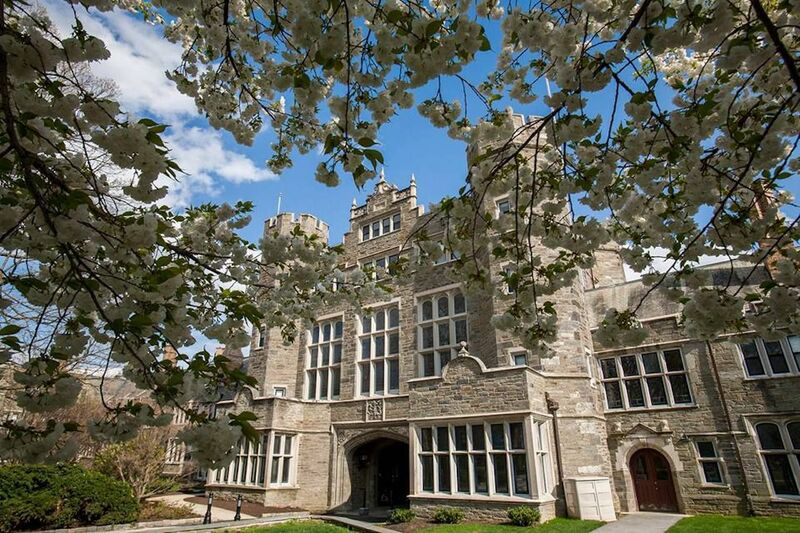 The campus of Bryn Mawr College has the perfect balance of lush green surroundings and gorgeous buildings. The whole 135-acre campus is designed as an arboretum, with more than 75 varieties of trees and scenic trails, as well as a duck pond. The stone buildings themselves are the highlight of this college, however. When walking into one of them, you’ll feel like you’re stepping into an ancient castle. As the oldest examples of this style of architecture in the US, known as Collegiate Gothic, they’ve been a model for other colleges since 1885. 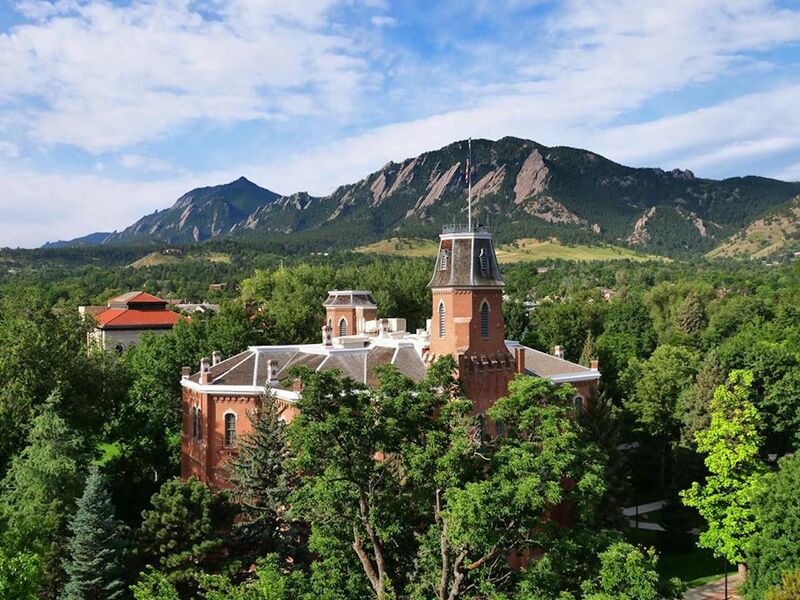 You can’t beat the setting of the University of Colorado, with gorgeous views of the Rocky Mountains and Flatirons, including a lake and two creeks. The buildings match the setting, featuring a distinctive architectural style, with local sandstone walls, limestone trim, and red-tiled roofs. Built in 1876, the Old Main was the first building on campus, and it’s now home to a museum of the college’s history and the Heritage Center.